The Tennessee Walking Horse is a unique breed that began in the mid 1800’s in the central part of Tennessee. This breed is a product of the farmers crossbreeding American Saddle horses, Standardbreds, American Thoroughbreds, English Thoroughbreds, Morgans, Canadian Pacers and Narragansett Pacers. The first Tennessee Walking Horse, “Black Allen”, was born in 1886. The Tennessee Walking Horse is well known for its easy calm spirit and its smooth and pleasurable gaits – flat walk, running walk, and canter. The flat walk should be true, bold, and four cornered. The horse should nod the head with every stride and bring each forefoot to the ground a mere second before the diagonally opposite hind foot, touches the ground. The forelegs should move straight, breaking at the knees and reaching forward in an elevated arc. The rear legs should follow through close to the ground, comfortable and over-striding the front tracks. The running walk should be the same general motion as the flat walk, but with additional speed. The horse shall exhibit a smooth gliding, overstepping, and four-cornered gait, with greater stride and accelerated head motion. The running walk should be a free and easy gait. Horses exhibiting an exaggerated, hesitating way of going, with tendency to point with the front feet are not inform. 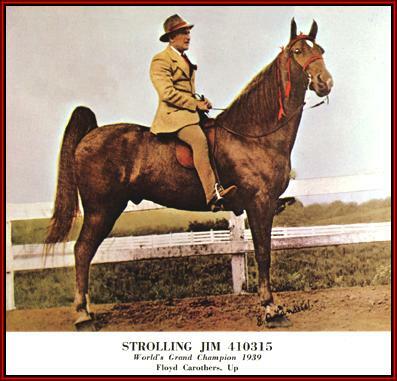 The canter should be smooth and straight on both leads, not walking behind, but cantering on both ends with a rolling, rocking chair motion, comfortable in hand. Exaggerating ‘pumping’ of the horse at the canter is not considered good form. In general appearance, the Tennessee walking horse should have an intelligent look, neat head, well-shaped and pointed ears, clear and alert eyes, and a tapered muzzle. The neck should be long and graceful and the shoulders muscular and well sloping. The back should be short with good coupling at the loins. The animal should be deep in girth and well ribbed and the chest should be of good proportion and width. The croup should be generally sloping and the hips well muscled with muscular development extending down toward the hocks. The legs should be flat and cordy. Information provided by the Tennessee Walking Horse National Celebration.